Caring Town Totnes is a new and unusual collaboration of over 70 local public, voluntary and private health and social care providers who are forming the Caring Town Totnes (CTT) Network. The Network includes referral organisations and service providers such as the Moor to Sea Local Commissioning Group, South Devon & Torbay Clinical Commissioning Group as well as Social Services commissioning groups, DCC adult social care, and NHS GP practices; plus organisations that cover life stages from birth to death such as the Daisy Child Care Centre and Totnes Caring; other need-specific voluntary sector organisations like the Memory Café; small private and community owned enterprises that offer services such as home care; and support organisations including the Community Police, Totnes Job Centre, CVS, CAB, local churches, South Hams District Council and Totnes Town Council. These people are on the frontline – they know most expertly what is needed in Totnes and the reality of our overburdened public services. They report that the spending cuts and increased demand for all modes of support is resulting in significant strain on both residents and services (be they statutory, private or voluntary), and we all know that more cuts are coming as the austerity agenda is pursued while demand increases with our ageing population. Other issues reported by our local sector include a lack of appropriate venues; little time for volunteer recruitment; finding good quality staff; fundraising is getting harder and more competitive; challenges in accessing the local market and raising their profile; little time to network; and a feeling that we are not reaching the most vulnerable and that services are not joined up enough. However our shared view that this is a huge opportunity to provide services which meet people’s needs in a far better way, and collectively we have the ideas and likely solutions for many of the issues we face. Since 2013, we have together been laying the foundations for a transformation in how we support all of us in our community, and particularly the most vulnerable. Our joint vision is of an integrated, mutually supportive and highly accessible local network and marketplace, combining professional and voluntary capacity working collaboratively to support those most in need. A small coordinating group, mainly organised by volunteers from Transition Town Totnes and Totnes Caring, has been given the remit to hold the CTT project and secure resources to build a part-time team to support project activity. CTT looks to provide a framework and infrastructure to support turning our vision into reality – but our role is also as a convener, bringing together the right local people and organisations to address specific local needs. For example, homelessness has been becoming a more visible and worrying issue in our town. We brought together 10 CTT network organisations and together produced a leaflet to make clear what help is available, and how people could best contribute to the solution, which includes a pilot ‘Giving Back’ scheme. Giving Back is where people who are enjoying a meal in town, can give money to the café or restaurant which then goes directly to support the local shelter for rough sleepers and emergency food bank, thus encouraging the community not to give directly to people on the street. In just a few weeks this has produced £2,000 in donations which is enabling the shelter to pay its utility bills and enhance its services. Another emerging partnership is between our secondary school, volunteers with appropriate mental health expertise and the national charity Family Lives. They are exploring innovative programmes to support our children and young people with mental health issues and importantly, supporting their families. Such issues are often defined as the school’s problem, but this is a more holistic approach seeing this as a concern for the whole community to tackle. The aim is to provide a more sustainable support network which utilises as yet an untapped resource from across the community. As well as these emerging projects addressing specific needs, we have 5 main areas of activity outlined as shown below, each of which connects with all the others, and all being in service to our local community’s wellbeing. 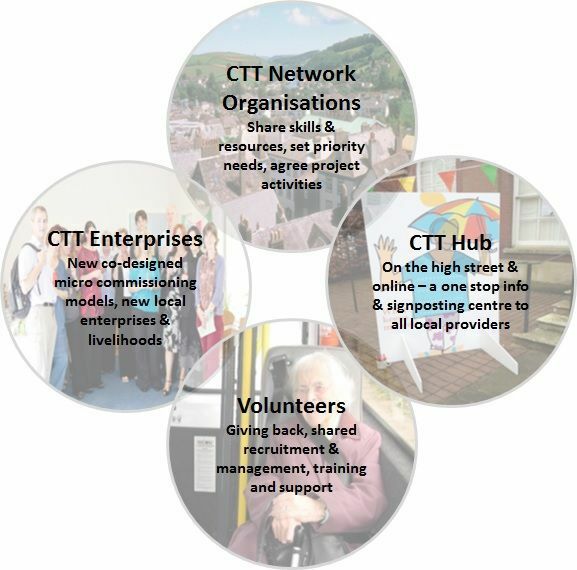 We aim to continue to develop and grow the CTT network and our capacity to share our skills and expertise as well as identify opportunities and priorities for shared activity; we’ll establish a CTT hub in the middle of town where anyone can go to find out more about local help and support on offer (plus an online hub); we’ll work together to grow ourvolunteering capacity and skill set; we will co-design and pilot new ways of commissioning services that support local needs and the local economy through a new community-led CTT Enterprise, and support the creation of new enterprises and livelihoods to meet these needs based on a sector-specific ‘economic blueprint’ and our localREconomy expertise ( as well as other local enterprise support). Some of this work is underway by volunteers, and we’re currently raising funds to support scaling up our capacity to do this work from early 2016 with some paid central coordination. We have funding bids under consideration by both Devon County Council and the Department of Health. Even before the austerity programme we believed that building our community’s response to adversity and vulnerability is an essential part of developing a resilient town. As a result of public spending cuts the need is growing. We believe that control of the health and social welfare agenda should ideally be in the hands of the community, in order to enable more sustainable and better targeted support and the building of a wider engagement in finding solutions. We believe that we can achieve more effective local social welfare services by developing partnerships between statutory, voluntary and community organisations – and only by utilising professional expertise alongside volunteer support can we ensure that safeguarding is appropriate. Responsibility and care for the most vulnerable is clearly still a national/local government statutory responsibility. However CTT is exploring what role community level organisations can ideally play as part of an integrated solution, given the external circumstance in which we find ourselves. CTT is therefore a proactive, positive recognition of the wealth of local skills, assets and creative energy in our compassionate town, rather than just a reactive response to cuts and will lead to a more resilient, healthy Totnes – we think it’s worth doing regardless. Reciprocity is an important underlying principle of CTT – that we can each contribute to, and benefit from directly or indirectly, a safety net that’s in place for everyone in our community. This means that everyone in a CTT network organisation is invited to participate as a resident, not just in their professional roles. It is important to us that we don’t hold a very distinct line between ‘us’ the service providers and ‘them’ – the community. We can all see ourselves as both users and providers of services. We want to see reciprocity becoming the norm, not just as a growth in volunteer activity across the town and surrounding area, but also a change in culture so that those in receipt of services feel empowered to be part of the wider CTT initiative – giving back where they can, rather than being solely beneficiaries. We believe that the best people to find solutions to local problems are the local people and organisations on the ground – the grass roots level, community ‘bottom-up’ response will find the best answers, be they new innovations or better ways of implementing current ways of working. The overwhelmingly positive and enthusiastic response from everyone involved so far gives us a sense of real possibility and confidence that a different future is possible – and our vision is viable – if we work together. Statutory, voluntary and private providers of health and welfare services feeling more able to collaborate and innovate together, each recognising s its place as part of the ecosystem of support that local people need throughout their lives, as well as offering peer to peer support and helping strengthen the system overall. As our CTT project develops further, we will continue to clarify and articulate our underlying principles and define our remit and activity in response to these times of change. We will be closely tracking our results and sharing our models and learning widely. By Fiona Ward on behalf of the Caring Town Totnes team, October 2015. Photos by Encounters Arts of Caring Town Totnes creative consultation project. "Being able to find solutions to large, and seemingly intractable problems benefits hugely from collaboration, between those providing services and those in receipt of the respective service. While it’s vital that we respect professional knowledge, it is important that those indecision making roles remain informed about how life is for most people, who are often the experts of their particular need. This way resources can flow better and there is a reciprocal relationship rather than people being ‘done unto’. We have learned the importance of being able to develop relationships with a diverse range of organisations and to adapt our language and processes to a wide range of contexts in order to bring about sustainable and systemic change at both institutional and community levels. Frances Northrop, Caring Town Totnes.